Racing XC, or just ready to fly up single-track the Talus Carbon Frame provides the platform to get you there. Having the right geometry and using the right carbon in the right places makes the performance of this machine unparalleled. The Talus Carbon frame paired with our selection of components make this bike a race-ready package at an affordable price. The Talus Carbon frame weighs in at only 1270 grams, it’s the lightest mountain bike frame we’ve ever made. Fabricated out of high modulus carbon fibers utilizing Direct Connect frame construction technology, it yields a responsive and fast on-trail ride. The tapered head tube and Shimano 142x12 thru axle rear end keep the bike stiff and in control. Maintenance can always be an issue off road, so we routed the cables internally to protect hydraulic lines and housings as well to help eliminate dirt and grime build-up—all maximizing cable life and minimizing headaches. An all Shimano XTR drivetrain paired with XTR brakes make sure that you're in command of the trail. American Classic Tubeless ready wheels paired with Schwalbe Racing Ralph tubeless ready tires keep traction regardless of the conditions under your wheels. The size specific FSA bar, stem and post are a nice finishing touch on this race ready machine. 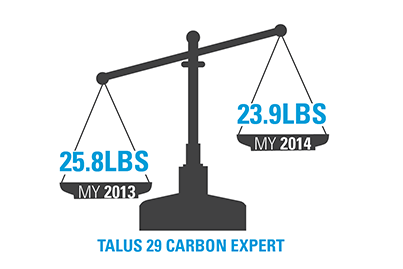 All the Talus bikes are lighter for 2014! Ready to race XC or go the distance, the Talus 29 Carbon is a must-have for any race quiver. At only 1270 grams, it's the lightest mountain bike frame we've ever made. Fabricated out of high modulus carbon fibers utilizing Direct Connect frame construction technology, it yields a responsive and fast on-trail ride. The tapered head tube and Shimano 142x12 thru axle rear end keep the bike stiff and in control. Maintenance can always be an issue off road, so we routed the cables internally to protect hydraulic lines and housings as well to help eliminate dirt and grime build-up—all maximizing cable life and minimizing headaches. The new XC race capable Talus 29 frame is the perfect gateway to an off-road escape. Our new frames have a modern geometry that pairs longer top tubes with shorter stems and chain stays, placing the center of gravity in the center of the bike. The result is a dialed XC fit that allows you to go faster with more confidence while having more fun. We never under value the importance of stopping power, which is why everyTalus 29 is spec'd with hydraulic disc brakes. Hydraulic brakes provide the power and added control that can mean the difference between staying on the trail or picking yourself up off it. One of the brakes we use is the Promax Decipher. Lightweight at 250 grams per brake, it features an ergonomic lever with reach adjustment, dual piston calipers, and is compatible with Avid BB5 pads when it's time for new ones.It's comfortable, powerful braking that inspires confidence and control with minimal maintenance. All of our mountain bikes receive new wheels for 2014. The Carbon Talus 29s have light race-proven American Classic wheels. The alloy Talus 29 bikes have all-new, lighter and stiffer wheels with better hubs and wider rims. 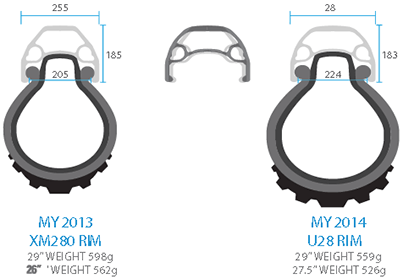 We gave them U28 disc-specific mountain rims that are 28mm wide. The wider rim cross section spreads the tread contact patch and allows riders to run lower tire pressure, with less tire roll. This larger contact patch allows riders to corner faster with more confidence. Racers can mount a narrower 1.95" tire that will behave and measure as a 2.1" tire. This option saves rotational weight and allows riders to accelerate faster while using less energy. The Talus 29 Expert has Novatec sealed bearing hubs ready for any conditions thrown at them. For 2014, all the handle bars went to a FlatTop style bar. A FlatTop bar reduces stack height for optimal bike handling.The bars are also wider to accommodate the ever-evolving mountain bike trails. Paired with these wider bars are size-specific shorter stems—a combination that ensures effortless navigation on the trail. American Classic MTB Tubless 29"
Schwalbe Racing Ralph EVO, TL Ready, Folding, 29x2.1"